Giuseppe Dell’Aria first appears in the Painesville, Ohio, area in 1921. In America, Giuseppe Dell’Aria was known as Joseph Dellaria. Giuseppe Dell’Aria, son of Giovanni Dell’Aria and Giovanna Barbera, was born on December 30, 1909, at Caltanissetta, Sicily, Italy. He first married Beryle LaBail, daughter of John LaBail. He married second, Clara Nakles. Giuseppe died on January 18, 1990, at Garfield Manor Nursing Home, Painesville, Lake County, Ohio, at age 80. His body was interred at Riverside Cemetery at Painesville, Lake County, Ohio. Giuseppe Dell’Aria, age 11, and his mother Giovanna Barbera, immigrated to the United States on February 9, 1921, travelling to Painesville, Lake County, Ohio, joining Giuseppe’s his father, Giovanni Dell’Aria. 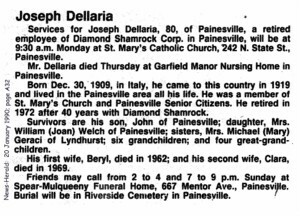 Joe Dellaria became a citizen of the United States on August 24, 1944. Joe resided at 792 North State Street, Painesville, Lake County, Ohio, when he was naturalized. Giuseppe Dell’Aria retired from the Diamond Alkali Company in 1972 after 40 years of service. 1. JoAnn M. Dell’Aria was born on September 17, 1938, at Painesville, Lake County, Ohio. She married William F. Welch on August 30, 1956. JoAnn M. died on January 16, 2011, at TriPoint Medical Center, Concord Township, Lake County, Ohio, at age 72. Her body was interred at Riverside Cemetery at Painesville, Lake County, Ohio. 2. John E. Dell’Aria was born on May 18, 1942. John died on October 2, 1998, at age 56.